post for a Tuesday Trigger butterfly card. I'm back again today, and I hope you don't mind. I had some time to drop in for a challenge that is new to me. It's Inspired By Stamping, where my friend Tammy is now on the DT. I just had to play in her honor! Here is the inspiration pic and we are to use a doily plus kraft/pink/cream. Another challenge entered: The Kraft Journal (Tammy's favorite haunt) - "Use Your Stash". (I'm using a bit of leftover doily and an already-stamped strip of paper right beneath the ribbon). I'm also playing at Papercraft Star, where the challenge is "Something French". You KNOW I'm all about that! 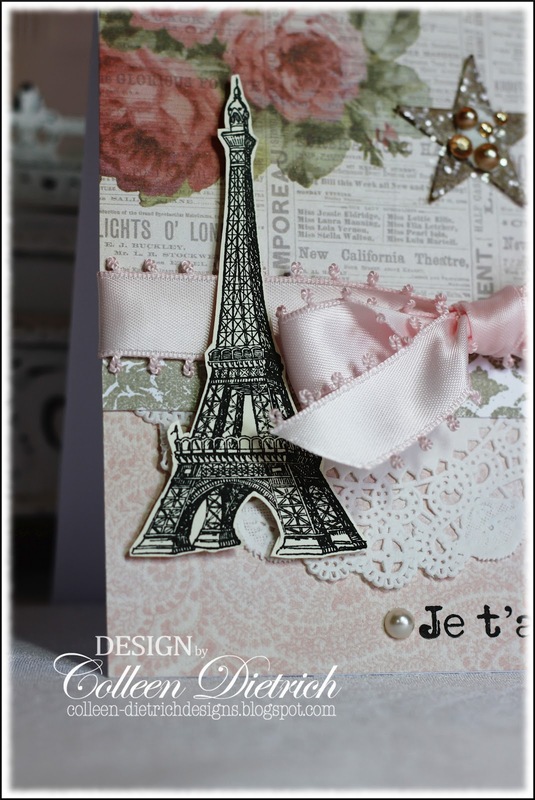 The Eiffel Tower and sentiment are from my new Technique Tuesday set, Mon Ami Paris. LOVE it! I found great prices on stamps at Overstock.com. The tower is stamped on ivory cardstock, as is necessary for the IBS challenge. After punching, I glittered it, then sprayed with hair spray so it'll all stay put. Then I cut a piece of pearl/gem tape and glued it on top. Please pardon our appearance as the glue is still drying underneath. LOL I just couldn't wait to photograph it and upload! Thank you all for visiting, and commenting. You make my day, you really do! Other: doily - Wilton; cereal box; star punch - Fiskars; clear glitter - SU; gem/pearl tape - Recollections; pearls - Queen & Co.
Gorgeous card Colleen, love that paper and the star accent....just beautiful! Aww, so sweet of you!!! So happy you are playing along with this GORGEOUS creation my sweet friend! I am in LURVE with your Gorgeous creation, but that is nothing new. You know you have me swooning with the doily , and the glittered star. You know how I love to use those! What gorgeous papers and Love the Eiffel Tower image. You rock! Oh this is so pretty and so chic (is that the right word?) .. all in all, beautiful....love the stamp! 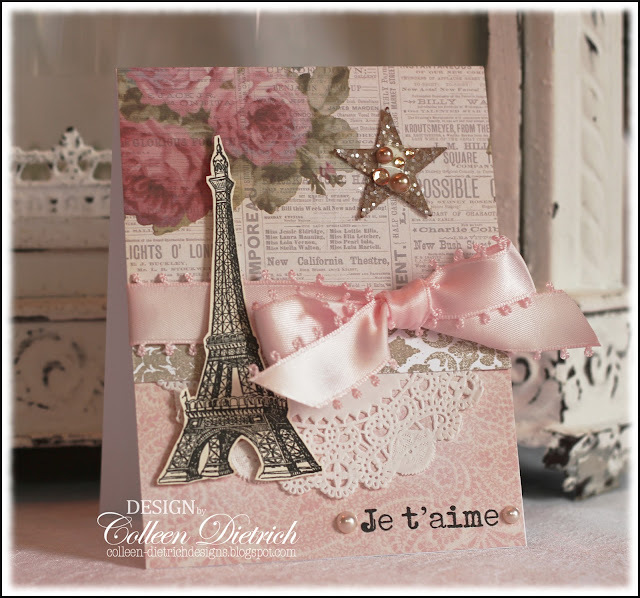 French shabby prettiness Colleen! So sweet of you to think of your friend Tammy. So very pretty! The Tower with a doily is perfect! OHHHH LA LA! 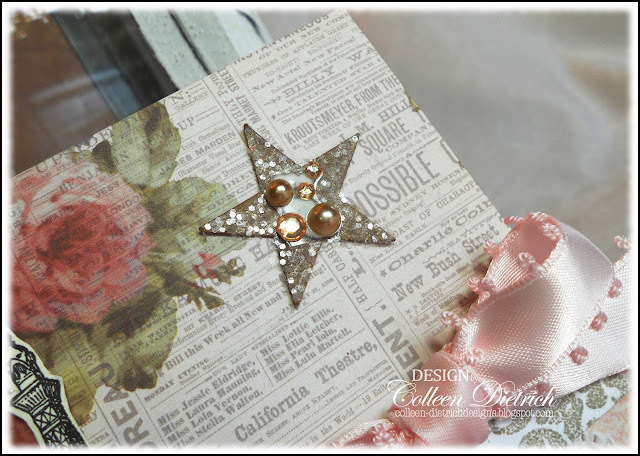 Love this vintage and shabby card! Those papers are beautiful--love that ribbon x10!!!!!!!!!!! Gorgeous pearls on the star...fab card all around:) LOVE ya! Your card is so lovely! The details add so much! Beautiful card, Colleen, I love the colors you used and the extras are fabulous! Thanks for joining us this week for the Papercraft Star "Anything French" challenge. 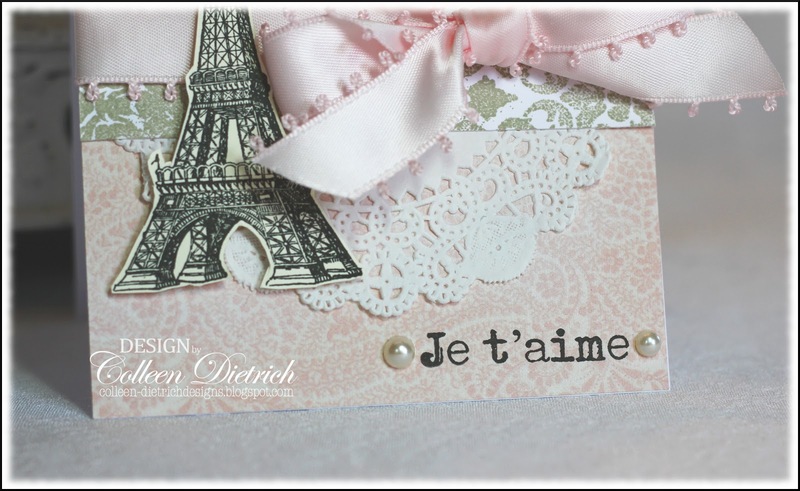 As romantic as the city of Paris!Love the papers and the stamp in particular. Now I see what can be done with a doilly - I've always been a bit fogged about these - other than under a cake! Have a great end to your weekend. Gorgeous card! Thanks for the tip on using hairspray to keep glitter in place. I was always wondering how to do that! Such a sweet and goregous card! I absolutely love it and in fact, plan to showcase it on our Feature Me Friday segment of The Kraft Journal blog on Friday April 27. Be sure to stop by the blog that day to see your feature and pick up your Featured Artist button as well! Thanks for playing along with us this week at The Kraft Journal too! Perfection! Love everything about this gorgeous card! So romantic! Colleen this takes my breath away. How beautiful this is. Your composition of paper and embellishments is spot on. What a beauty!!! What a fabulously French card! Love that star! Thank you so much for sharing your card with us this week at Papercraft Star! Wow Colleen this is so chic, love the ribbon, love the doilie and the star but the way you have put it all together makes it so special. You have outdone yourself with this one. I love pink and kraft together. This is gorgeous. Thanks for joining us at The Kraft Journal this week. Everything about this card is so pretty.. It is a perfect design.. Your photos look great!! Oh, wow! Colleen, this is beautiful. Those papers are terrific and I love that star. Of course, the ribbon is yummy, too. Some great crafting going on here. This is absolutely gorgeous, Col! LOVE those soft pastels, and your ribbon is ooo-la-la! Delish! Thanks so much for playing along with us this week at Papercraft Star! I just popped over today to have a look at your gorgeous Papercraft Star entry, and here I have spent 15 minutes looking around ! Wow! You are a total package, knowledge and talent !! Like overstock.com, I would never have thought to look there for inexpensive stamps, and your technique on the honeycomb, again amazing. VERY cool site here, Colleen ! I have really been inspired, and will be back often. Oh, and thanks for playing with us at Papercraft Star too !! LOVE this French flair, Colleen! LOVE how you combined the papers and that PRETTY ribbon! LOVE the star with the bling! GORGEOUS card! My favorite!!!!! So beautiful Colleen!! I looooove it!! I'm glad you found those pretty papers. The star is amazing with the glitter and jewels! OMG Colleen I almost fainted....No just kidding but this card has eveything that I love. You are wonderful when it comes to elegance and subtle details. And this card also shows us that you always put a lot of effort and time on a card. And it shows off. Wow wow wow! I have to catch up I know; I am looking forward to a few days of. This weekend there will be more time to have a look at all your handmade gems. I missed quite a few.. So BEAUTIFUL, Colleen! Wow, I can see why you've gotten so many pins with this gorgeous creation. This is inspired, and in turn so very inspirational. I just love what I'm seeing here. Yay for you!! I know you'll meet with all kinds of success with this card. Kudos to you! I love youre card it is lovely. Lucky if you get such a beauty! Dear Colleen, Congrats on being the winner of IBSIC - Challenge!! You are so well deserved!! This card of yours is sooo lovely!! I Love it so much! Beautiful card! Congrats on being featured at The Kraft Journal! Oh, I love these papers, too...and you've made them look so soft and romantic with the theme of this card. Kudos on all the attention it's receiving...YOU definitely deserve it! You mentioned this card, so I had to come check it out and I am so happy I did! This is absolutely gorgeous!!! Congratulations on the win at IBS. I didn't know they were doing challenges now, so I'll have to check it out. Beautiful card girl! You rocked that challenge!